Lee Anne Bledsoe, manager of WKU’s Crawford Hydrology Laboratory, recently returned from Belo Horizonte, Brazil, where she presented a weeklong groundwater investigation workshop to a group of Brazilian hydrologists and cave explorers. Crawford Hydrology Lab Manager Lee Anne Bledsoe trains a Brazilian hydrogeologist to calibrate field equipment used for tracing underground water flows. The workshop detailed techniques for using fluorescent dyes to study the flow of underground water. These are important methods to understand and protect groundwater, especially those in limestone karst regions like those in southcentral Kentucky. Brazil also has well-developed karst regions, but which have typically seen relatively limited hydrologic study. The workshop was organized for Carste Ciência e Meio Ambiente, a Brazilian environmental consulting firm, providing training to better address environmental and water resource issues in Brazil. The Crawford Lab, within WKU’s Applied Research and Technology Program, works with a range of companies and agencies around the United States and world to provide specialized groundwater investigation services and training. Such training provides an excellent opportunity for outreach, as experience in these methods is limited in many parts of the world, including South America. Lagoa Santa, the best known karst area in Brazil, faces severe environmental threats from limestone mining and the growing urban sprawl of Belo Horizonte, Brazil’s sixth largest city. While Brazil’s environmental regulations protect caves in this area, the groundwater systems that formed them and continue to provide water for drinking and agriculture are not as well understood or regulated. Groundwater tracing can provide key information to landowners, regulators and scientists so that these resources can be better managed and protected. This intensive, hands-on program was delivered by Bledsoe for a group of seven geologists and she also presented lectures to another 25 scientists. Participants were not only exposed to lecture and discussion of dye tracing techniques but also got experience in laboratory procedures, equipment operation and field methods. 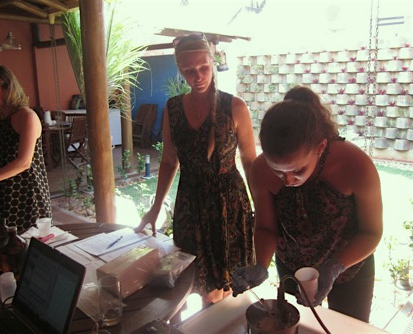 The group conducted two dye injections in the Lagoa Santa area and was able to collect new hydrologic information for one of the groundwater basins in the area, adding groundwater travel times to their base of knowledge. Knowing how quickly or slowly groundwater is moving can assist in remediation, emergency response, along with protection and management of groundwater resources. CHL and Carste Ciência e Meio Ambiente plan to continue their partnership through additional training sessions in the U.S. and Brazil through a scholar exchange program. Carste Ciência e Meio Ambiente is directed by Brazilian hydrogeologist Augusto Auler, who received a master’s degree from WKU in 1994. In addition to providing consulting services, Auler and his company organize and participate in scientific research and cave exploration throughout Brazil. Partnering with organizations in this way allows the Crawford Hydrology Lab to support capacity building and environmental protection strategies throughout the world.